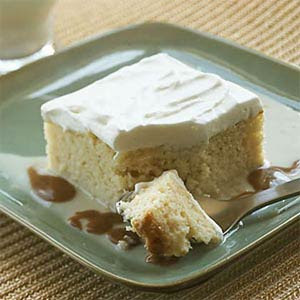 When i lived in Dallas, one of my favorite deserts was Tres Leches Cake (Cake of Three Milks). It's delicious moistness and softness is comparable to the cloud nine -it's that good! In Dallas i've never baked this cake, because, honestly, who wants to slave in the kitchen with quite unpredictable results (perhaps, even disastrous), when you can just pop over to any of Carnival or Fiesta stores and easily get yourself a slice of this dreaminess. Well, i'm not in Dallas anymore. I'm sure there is a good enough bakery in Dubai that whips up this yummy cake on the regular basis. I just don't know which one it is. This particular recipe - and there is TONS of recipes for Tres Leches Cake on the web - is from my favorite kitchen geek Alton Brown. I guess, i need to confess that i myself haven't tried it out yet, but according to the reviews on his page, this is a good one. Also, Alton can do no wrong in my book. Don't freak out if you don't have cake flour on hand. I usually don't. Just put 2 tablespoon of cornstarch at the bottom of the measuring cup and fill the rest of the cup with the regular flour. I believe Maria Bonita on Umm Al Sheif road serves this.